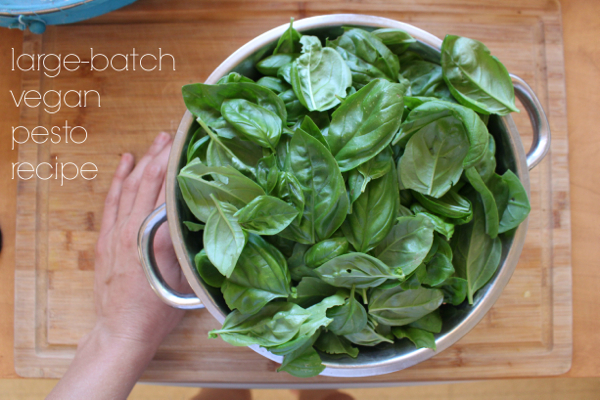 In last week’s Pictures Of Things + Le Love List, I posted a photo of some freshly made pesto. Bonzai reader Katie asked me about the recipe, and that’s when I realized — I’ve never posted one! 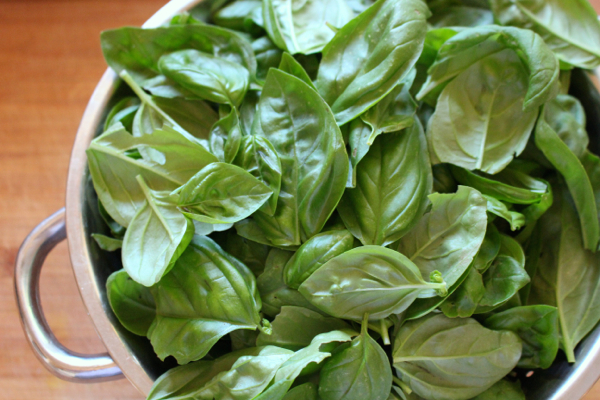 I make pesto every year, when basil is in season, fresh and local (and cheap!). I make it in big batches, and I freeze it in ice cube trays. 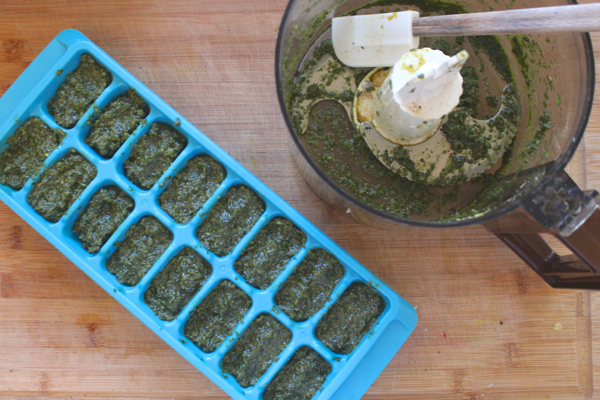 Then I pop the frozen pesto cubes out of the trays, transfer them to big glass jars, and store them in the freezer for easy, ready-to-go pesto, all year round. The recipe I’m sharing here today is actually one I developed way back in Portland. Back then, there was this one farm at the Saturday Farmer’s Market, and for a few weeks each year, their basil would go on supersale blowout. I don’t remember the exact price, but it was the cheapest organic basil I’d ever seen, and it’s what first inspired me to figure out a way to preserve basil while it’s in season and oh-so-abundant. 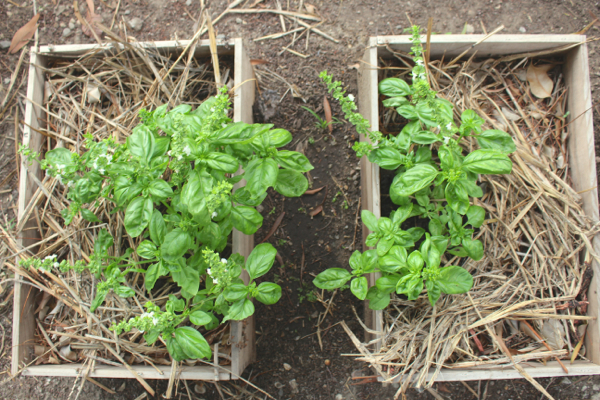 These days, I grow my own my basil in my garden, and right about now, it’s overflowing. These plants actually overwintered from last year, hanging on through the cold months as scraggly little things. But come spring they exploded, and now between five healthy stems, I’ve got a basil bounty I can barely keep up with. So okay, it’s pesto time! Remember that this is a “big-batch” recipe. It’s meant to make a lot, so you’ll have plenty left over for freezing. Back in Portland I used to make 3 or 4 batches of this stuff in a single night. These days, I’ll make one batch every few weeks, as long as the plants provide. That will leave me with a nice stash of pesto to get me through fall. 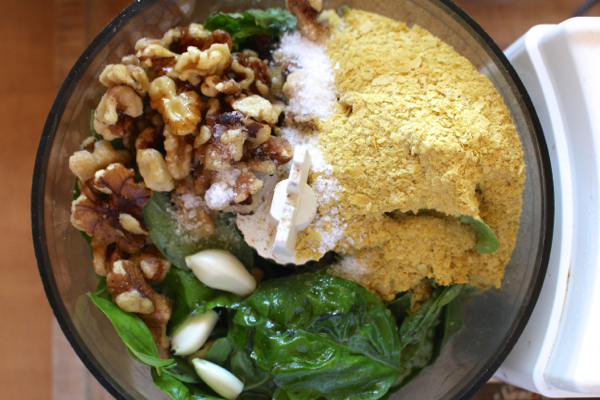 Put all the ingredients in a food processor (you may have to press down the basil to make it all fit). Process the ingredients, stopping every so often to scrape down the sides, until throughly combined. You want just a little bit of texture — not too clumpy, but not a paste either. 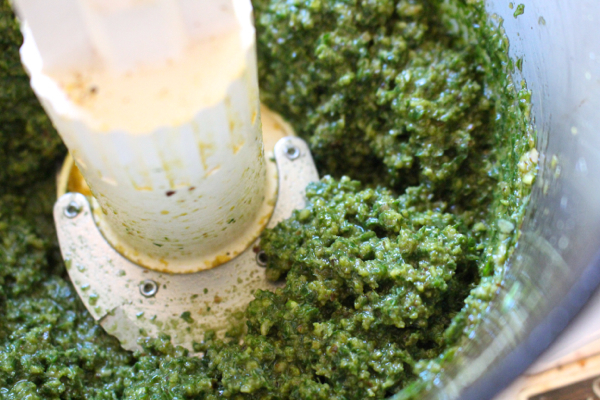 When the pesto is done, transfer it from the food processor. You can store it in a glass jar in the fridge, to use in upcoming recipes. It will last about a week (maybe 2) stored this way. Or, you can do what I do, and fill an ice cube tray. This recipe fills a standard-sized ice cube tray, and once the cubes are frozen, you can pop them out and store them in a glass jar or plastic bag, in the freezer, for easy access. Freezing them as cubes allows you to take as much – or as little – as you want, whenever you need. And that’s all there is to it! The whole thing, from start to freezer, takes about 15 minutes. Not so bad for preserving some seriously flavorful food, right? This pesto is seriously my jam. 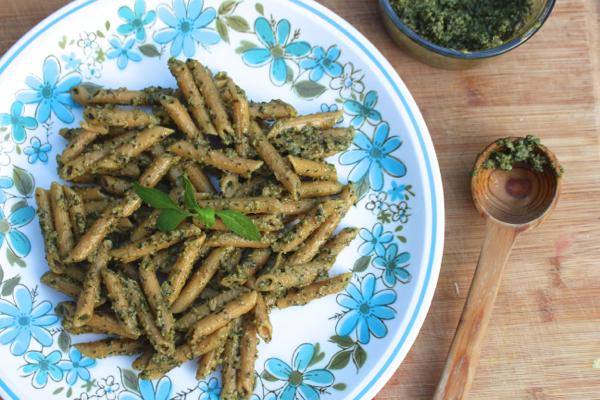 It’s not too oily like many pesto recipes, but it’s also not too dry. Juuuust right. 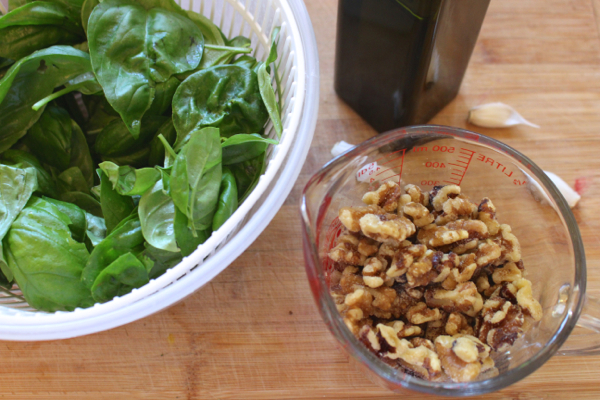 I like to use walnuts because I love the flavor, plus they have healthy omega-3 fatty acids. 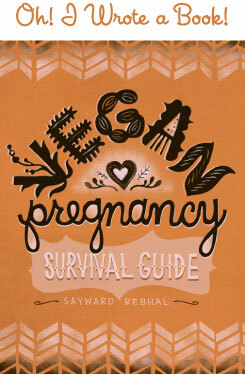 But I’ve made this with many variations over the years, like hemp seeds, pumpkin seeds, pine nuts, etc. You can sub any nut or seed and you’ll get the same results, so feel free to play around. Love the idea of freezing in ice cube trays!! I hate having to waste my Basil, it’s such a good grower:) Now I don’t have too! This recipe it’s sooo yummy! I have to try it! And the idea to freeze it in cubes is great!!! :-D Thank you!! You grow it too? It can be so fickle! I’ve had bad luck with it in the past, but this year it’s been soooo happy! Glad you like it Olgui! My basil plant is out of control right now. I can’t wait to make this, and I’m totally freezing it in cubes too!